Looking for a lightning fast black-and-white copier? Look no further than the Ricoh Aficio SP 9100 DN! For your high volume office, this printer will live up to your expectations. With a speed of 75 pages per minute, your urgent printing jobs will be done in no time! ou will no longer find yourself having to constantly refill the paper trays. The Ricoh Aficio SP 9100 DN holds all manner of media from 5.5 X 8.5 all the way to 11 X 17, from 16 to 34 lb. sheets. The flexibility and functionality of the Ricoh Aficio SP 9100 DN will make your largest printing jobs seem like a walk in the park. Ricoh is a company well known for their commitment to the preservation of our environment and the Ricoh Aficio SP 9100 DN has features that support that commitment. With sleep mode to save power and paper saving duplex mode, you can rest easy knowing that you are running a machine as green as can be. 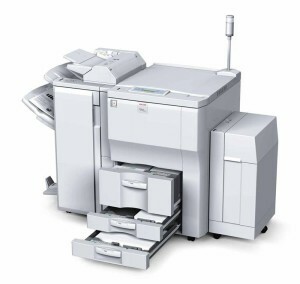 The Ricoh Aficio SP 9100 DN also runs quietly and has low ozone emissions and a toner recycling program. As for technology. its easily connected to your network using a standard ethernet cable and USB interfaces. This model is compatible with most of today’s graphics applications. Call us today to learn more about this amazing machine!